Trucking accident attorneys must look at all possible causes of accidents. Usually the culprit is driver error, but possibly equipment failure could be the cause. Over the years, we have represented drivers whose equipment has failed including axle failure, wheels falling off of the axle, and brake failure. Driver Log books often are manipulated and do not tell the whole story of active or passive driver time. Qualcomm technologies from San Diego integrates fleet management into commercial driving fleets. The speeds of the vehicle, performance of the driving, and hands free communication can be integrated into the system. If the Truck is equipped with such technology, it is imperative to get this information as much can be learned about the accident. Getting qualified accident engineers to the scene is a must in larger accident cases; our team of experts will dispatch on the scene to gather key evidence and shoot digital photographs that can be used in computer survey and accident reconstruction analysis. Victims must not delay retaining an attorney as time is of the essence to preserve the facts of the case. 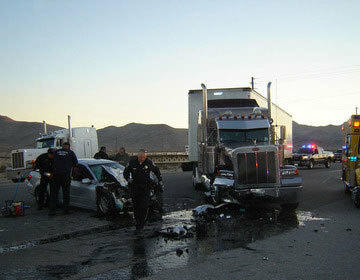 Driver error is the #1 cause of truck driving accidents and requires an experienced Nevada truck driver attorney. Operators of tractor trailers travel hundreds of miles attempting to meet pressured delivery deadlines. Overworked and often exhausted drivers only make money when they are driving and it is usually paid by the job-- not the hour. This encourages speeding and driving extended hours all of which contribute to an increased risk on Nevada Highways. Annually, truck crashes kill over 5,000+ people and over 150,000 are injured. Commercial trucks accounted for 13% of all passenger vehicle deaths in 1999 yet represented only 3% of all registered vehicles per NHTSA, 2001. Truck driver fatigue is a contributing factor in as many as 30 to 40 percent of all heavy truck crashes as a tired truck driver is a danger to all those sharing the road. A 1995 National Transportation Safety Board study found that of 107 heavy truck crashes, fatigue was a prominent factor in 75% of the run-off-the-road crashes, with 68% of long-haul drivers and 49% of short haul drivers suffering fatigue-related crashes. Working long shifts not only radically increases the risk of performance errors due to lost alertness and drowsiness, but it also impairs a trucker's ability to gain proper restorative sleep even when they have sufficient off-duty time for sleep; Federal Highway Administration or FHWA 1997. Truck Drivers must keep logbooks and not drive more than 8 hours without a 30-minute break. Given that truckers are normally paid by the mile, the need for speed is apparent. The more one drives, the more one makes. Trucks that are idle are not making money for the owners. This is often the case for even large fortune 500 companies who still pay their drivers by the mile. Why does this matter? Drivers who forego mandatory rest breaks or exceed the amount of time they are allowed to drive in day are often exhausted, over coffee upped, and occasionally drug impaired. This is a recipe for disaster. Semi truck operators are required by the Federal Motor Carrier Safety Administration (FMCSA) to keep a log tracking their hours of operation and mileage driven. With the implementation of the mandated Electronic Log Data (ELD) devices, cheating is no longer possible. Nonetheless, staring at the road for hours at a time can become hypnotizing. A fatigued driver lacks awareness which may have an adverse effect on his/her perception reaction time causing an accident. The Motor Carrier Safety Act of 1984 prescribes minimum safety standards for all commercial drivers, including time of continuous driving hours and sleep. For more information see S.2174 - Motor Carrier Safety Act of 1984. The standard is also higher. Commercial drivers must drive with a duty of care that is that of a commercial driver. One who obeys the speed limits, rests, does not use any medications while driving. Commercial drivers must have a CDL, which is a commercial driver’s license and involves extra training and rules, which our law firm will make sure they live up to. Electric Logging Devices or Data Recorders are now mandatory in all semis and large trucks, with the ELD rule being enacted on February 16th, 2016 with the compliance date of December of 2017. Similar to the black box on an airplane, such devices track speed, time of impact, braking use and other vital information necessary for an investigator. All commercial trucking companies are required to equip their semi trucks with Electronic Logging Data (ELD) or recording devices pursuant to the Federal Motor Carrier Safety Administration (FMCSA). The ELD's record critical data which often reveal the cause of an accident and all ELD's must be able to transmit data either through the wireless web or through a thumb drive. In other words, the critical operations or driving data is available to an injured victim. While there are a selection of ELD software devices, many track the following: Drivers log, miles or operation hours, vehicle movement including speed, braking, and lane or steering changes, route taken, duration of engine operation, dispatch start and stop times, and vehicle maintenance. All of which is critical in establishing fault in a semi truck accident. In downloading this information we can establish if the semi truck driver changed lanes, applied the brakes, or was speeding at the time of the accident. Hiring a lawyer with experience in interpreting the ELD data is crucial. Experienced trucking attorneys will get the black box for their experts to analyze such that spoliation of such information will cause the Courts to give specific and advantageous rulings for an injured plaintiff. When a commercial driver errors and pulls out in front of oncoming traffic there is no excuse for this carelessness. High up in the cab, they have complete line of sight to see traffic. This is a huge error as trucks are slow, often pulling a heavy load; this means it takes more time to travel. A lack of this perception is most likely the result of an inexperienced operator. Given the slow operation, the trucking company is likely to counter argue that the vehicle that collided with it was speeding. It is imperative to get experts involved in the case to measure skid marks, review the traffic accident reports, and talk with witnesses to fully evaluate the accident. Call us today if you suffered a similar accident and we will give you the advice you need. Delay can affect your rights, so call now. Traveling too fast for traffic conditions such as congested traffic or harsh weather conditions like rain or snow is an obvious form of avoidable negligence. Semi trucks in the United States are allowed up to 80,000 pounds stretched over 18 wheels. Stopping or slowing a semi truck under wet or snowy conditions is a monumental task and is capable of causing a fatal event, demolishing anything in its path. Truck drivers must travel at speeds appropriate for conditions, within the speed limit, and provide an adequate distance from the vehicle traveling in front of them which allows them a safe distance to come to a complete stop. 18 wheelers also maintain a higher center of gravity which makes them prone to jackknifing or rollover accidents. Further, truck tires are not designed to travel at speeds in excess of 75 mph. Manufacturers of semi truck tires have not changed their design in the past decade when highway speeds were limited to 65-70 mph. Speeds in excess of 75 mph place the trucks tires under severe stress resulting in tire tread separation and blowouts. When tire failure takes pace at high speeds the driver is incapable of controlling the semi truck. It's the equivalent of a locomotive off of its tracks. Federal Trucking Law is covered 49 Code of Federal Regulations and mandates trucker work hours including, but not limited to 14-Hour Duty Limit with a period of 14 consecutive hours of duty time after being off duty for 10 or more consecutive hours. The 14 consecutive-hour duty period begins when driving is started. Once completed, 10 hours of rest must be had. Federal trucking law must be looked at when evaluating a personal injury case involving a tractor trailer. Our law firm has handled a variety of trucking accidents throughout the state of Nevada including far fetching counties and jurisdictions away from our populated areas of Washoe County (Reno/Carson City) and Clark County (Las Vegas/Henderson). Because Trucking accidents occur in both the South and North regions and the domicile or headquarters of most companies are outside of Nevada, we must often file a lawsuit in US Federal Court; in addition truckers are also governed by federal law which mandates litigation of such matters in Federal Court. All truckers are governed by the FMCSA for Federal Motor Carrier Safety Administration. Only experienced attorneys should venture into Federal Court where the timelines are strict, the rules complex, and the law so expansive. Our law firm has filed trucking accidents in the Northern Division and the Southern Division of Nevada—the only two places to file such accidents. We have no problem in going to other parts of the state even though our headquarters in Las Vegas, Nevada. Federal rules include such things as vehicle weight FDRC-Not to exceed 80,000 pounds loaded, vehicle width (not to exceed 102” or 8.5’ wide), safety compliance standards including use of certain warnings when a truck has broken down and stuck on the roadside. Any truck over 10,000 pounds or carrying over 9 passengers is deemed to be commercial such invoking the higher duty standard discussed. Types of loads are strictly governed including hazardous materials and cargo securement. Drug and Alcohol is strictly monitored including when and how often testing is to be performed by the company. On June 30, 2013 new rules went into effect regarding a commercial driver’s rest period as it relates to driving. This can be found at: 76 FR 81188, Dec. 27, 2011, as amended at 78 FR 58485, Sept. 24, 2013; and @ 49 CFR 395.3. A 4,000-pound passenger car is no match for a 30,000-pound double axle rig, or a 75,000 pound loaded rig. Property damage is significant and injuries ranging from severe to death. We have represented both truckers and cars hit by trucks. If you have been injured by a commercial truck, either as a trucker yourself and/or as a motor vehicle operator where you got the raw end of the deal, please call us to discuss your matter. Not only must you contend with the larger vehicle, you will then be subject to a corporate conglomerate or well financed insurance company who’s goal is to prevent you from getting what is owed to you. Our firm is dedicated to helping those hurt or heirs of those killed, to get fair and reasonable compensation. Please email or call us today: 702-382-9797.